Property 2: 2--- 7--- MINUTES FROM EVERYTHING THAT IS GATL---and--SMOKY MTN. Property 3: 7mins away from Downtown Gatlinburg, TN/ 2bedroom/1 bathroom/ hot tub and more! Special 7 day Valentine's Day vacation. Feb 8-15 2019 Westgate Smoky Mt Resort. Property 9: Special 7 day Valentine's Day vacation. Feb 8-15 2019 Westgate Smoky Mt Resort. Beautiful park setting. Mountain view. Gatlinburg /Pigeon Forge. Property 19: Beautiful park setting. Mountain view. Gatlinburg /Pigeon Forge. Property 24: Spring Break Special - 4-20 / 4-27-19 2 bedrooms, $1200. Smoky Mountains; A Vacation to Remember!!! Property 29: Smoky Mountains; A Vacation to Remember!!! Sept. 3-7Mountaintop Villa: Unbelievable rates: Quiet time in Smokies! Property 33: Sept. 3-7Mountaintop Villa: Unbelievable rates: Quiet time in Smokies! Mountain Loft Resort ,Gatlinburg Tn. Message me if you want a specific week. 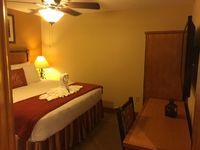 Property 42: Mountain Loft Resort ,Gatlinburg Tn. Message me if you want a specific week. Enjoy your Christmas in a beautiful two-bedroom cabin in Gatlinburg TN!!! Property 43: Enjoy your Christmas in a beautiful two-bedroom cabin in Gatlinburg TN!!! My wife and I really enjoyed staying in the cabin. We only used the kitchen for minimal cooking (toaster, coffee maker, refrigerator, etc...) but everything functioned as expected. There are two bedrooms, we only used one of the beds to sleep in and it was pretty comfortable. We had to reach out to the owner and they were very responsive in getting back to us. The road to the cabin was nicely paved and easy to get up. Close to downtown and all the tourist stuff. Would stay at again.